Encounter the beauty, adventure and fun of the North Cascades! North Cascades Institute, in partnership with Seattle City Light and North Cascades National Park, offers visitors fun, interactive tours of the Upper Skagit Valley and North Cascades National Park. 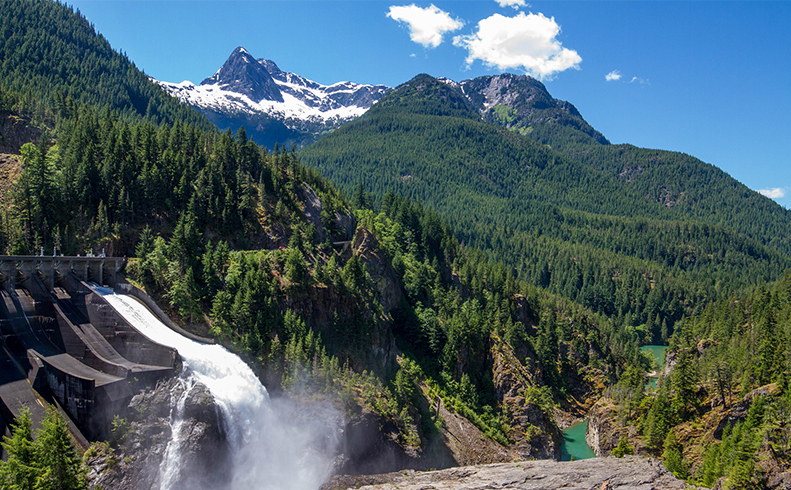 Experience the jaw-dropping beauty of Diablo Lake and the North Cascades, learn about the fascinating history of the Upper Skagit Hydroelectric Project and enjoy a delicious home-cooked meal...read on to discover the many different options that await you! Popular boat tours aboard the Alice Ross IV exploring the stunning beauty of Diablo Lake while learning about the interesting natural and cultural history of the North Cascades. Your experience includes a delicious, locally-sourced lunch at the North Cascades Environmental Learning Center. Tours are offered Thursdays - Mondays from Late June - September. Visiting North Cascades National Park but pressed for time? 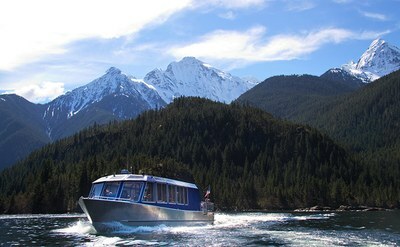 This tour is the same as the popular Diablo Lake & Lunch Tours but a shorter experience without lunch. Cruises are offered Fridays, Saturdays and Sundays from Late June - Early September. Step back in time on this guided walking tour of Newhalem and Seattle City Light's Gorge Powerhouse. Learn about the town's fascinating past and how it still thrives today. A unique part of the tour is a look inside of the Gorge Powerhouse — normally closed to the public — to see how hydropower is made. After the tour, enjoy a picnic lunch made from local and organic ingredients. Tours are offered Saturdays and Sundays from Early July - Early September. The quiet town of Newhalem has a lively past and once hosted hundreds of visitors who marveled at the “wonders of electricity" produced by the Skagit Hydroelectric Project. The unique opportunity to experience Newhalem at night once again is back with a free guided walk to Ladder Creek Gardens and "Dam Good" chicken dinner or vegetarian lasagna at the Gorge Inn. Tours and dinners are offered Thursdays and Fridays from early July - late August. Take a free guided walking tour of Newhalem and the nearby trails with National Park Service rangers and guides from Seattle City Light and the North Cascades Institute. These 45-minute tours could include Newhalem's historic Main Street, Ladder Creek Gardens, Trail of the Cedars, and/or the Gorge Powerhouse Visitor Gallery. Lunch is also available at the historic Gorge Inn around noon on the weekdays. 2017 Walking Tours are daily at 11 am and 2 pm, no registration required. Cancellation policy: If a registration is cancelled 7 or more days prior to the tour date, we will refund the full amount in the same manner it was paid. No refund for cancellations less than 7 days out from a tour. For personalized assistance, questions or help to make your reservation, contact our friendly Skagit Tours team Monday thru Friday, 8:30 am - 4:30 pm. Towering peaks, unbelievable turquoise waters and a fascinating cultural and natural history are more than enough incentive to visit... Skagit Tours will give you a good introduction to the region." Lunch at the Environmental Learning Center is served buffet style, and I was surprised at the freshness and creativity of the meal. I opted for a salad, salmon chowder, and shepherd’s pie. The shepherd’s pie was the best I’ve ever had, and I went back for seconds. During lunch, the Chef Justin came out to chat with the group. He explained that they source their foods within 125 miles east and west of the center, and they strive to have “the best food quality they can.” I have to say, from the lunch they prepared for us, it showed. We visited three powerhouses, and got to go inside one and back in time in two. We ate an amazing, locally sourced lunch at the North Cascades Institute and got a short-but-sweet tour of the nonprofit’s Learning Center on the shores of Diablo Lake... We climbed aboard a boat to get on the waters of Diablo Lake and take a closer look at Ross Dam... I know there’s much more to what lies off Highway 20 than what you can see from your car."